A wide range of sensors operate in the spectral region of the electromagnetic spectrum where they provide information that allows characterization, mapping, and monitoring of wetlands. Key among these are the Landsat sensors and Moderate Resolution Imaging Spectroradiometer (MODIS) . The Landsat series of sensors have been the Multispectral Scanner System (MSS), Thematic Mapper (TM), Enhanced Thematic Mapper (ETM+), and the Operational Land Imager (OLI). The Landsat MSS was launched on July 23, 1972 and provided the first moderate resolution global observations of the world’s surface in the visible and near infrared regions. Three more MSS sensors (Landsat 2-4) followed. 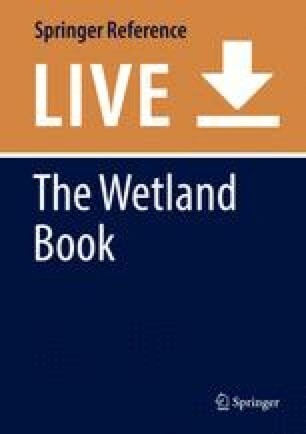 While the radiometric range was low, these data provide the oldest and most detailed record of the extent of wetlands. First launched on 16 July 1982, the TM operated in six spectral bands and one thermal. The Landsat ETM was launched in 1999 and again observed in six spectral bands (visible to shortwave infrared) with an additional panchromatic band as well as a thermal band. Following the failure of the Landsat-6 at launch on October 5, 1993, users were dependent upon the Landsat-5 and 7 and observations were compromised by a partial failure of the latter. However, as part of the Landsat Continuity Mission (LCM), the Landsat 8 OLI was launched on 11 February 2013 and operated in the same wavelength regions as the ETM+. In addition to the bands used in the previous TM and ETM+ missions, the coastal blue channel was included as well as a cirrus channel (1.36–1.38 μm), with the latter facilitating better atmospheric correction because of sensitivity to atmospheric constituents. A particular advantage of the Landsat series is that a long historical record of the extent and characteristics of wetlands globally is provided, although observations have been compromised by the relatively low temporal frequency (every 16 days with this increasing when more than two sensors are operating) and cloud and cloud shadow in many regions. The MODIS is on board the Terra (EOS AM) and Aqua (EOS PM) satellites, which collectively view the earth’s surface every 1–2 days in 36 spectral bands (2 at 250 m resolution at nadir, 5 at 500 m, and 29 at 1000 m spatial resolution) or groups of bands. Observations are in the visible, near infrared, short/mid-infrared and thermal bands. For wetland mapping, this sensor provides opportunity for capturing short- to long-term flooding events across large areas. A number of products are commonly used including the Nadir BRDF-Adjusted Reflectance (NBAR) and the 8-day land surface temperature product (MYD11A2) (Ordoyne and Friedl 2008). Other sensors providing useful information for wetland mapping include the moderate spatial resolution SPOT, High Resolution Geometric (HRG), the ALOS AVNIR-2, and the Terra-1 ASTER. At finer spatial resolution, Very High Resolution (VHR) spaceborne multispectral data allow considerable detail to be resolved in wetland environments. Among these are the Quickbird and IKONOS sensors, although the Worldview-2 is particularly useful because of the presence of coastal, yellow and red edge bands, which allow better detection and description of water and vegetation. Stereo viewing capability also allows the extraction of digital elevation models (DEMs) that are useful for hydrological analysis. For mapping the extent of wetlands, Synthetic Aperture Radar (SAR) technology has proven to be effective as persistent cloud, smoke, and haze prevents observations using optical sensors. Furthermore, microwaves are able to penetrate vegetation and interact with the underlying surface, thereby allowing detection of flooding. SAR data have therefore been used for mapping inundation and land covers, and retrieving biophysical properties. Key spaceborne SAR operating at C-band (5.3 GHz) have included the European Space Agency’s (ESA) European Remote-Sensing (ERS) satellite-1 (1991–2000) and -2 (1995–2011) and the Canadian Space Agency’s (CSA) RADARSAT-1 (1995–2013) and -2 (2007–present). The ENVISAT Advanced Synthetic Aperture Radar (ASAR; 2002–2012) was also launched in 2002, with this operating in imaging mode (IM; 30 m) and two ScanSAR modes, the Wide Swath Mode (100 m) and the Global Monitoring Mode (1000 m). These latter sensors allowed observations up to 10 times per month when descending and ascending acquisitions were combined and were particularly beneficial for mapping and monitoring the extent of inundation. A limitation was that the large scan width lead to variations in backscatter because of large incidence angle differences across the swath and also because of varying surface moisture conditions between observation dates. The resolution was also insufficient to detect small features (e.g., ponds, rivers). The Tandem-X mission, operating at X-band (9.6 GHz), was also instigated by the German Space Agency (DLR) and integrated the TerraSAR-X mission (launched in 2007). By using these paired satellites, digital elevation models (DEMs) of the global land surface are being generated with these complementing that provided by the Shuttle Radar Topographic Mission (SRTM) in 2000. The DEMs provided by both sensors are particularly useful for indicating the distribution of wetlands as well as river networks. A number of L-band (1–2 GHz) SAR have been launched, primarily by the Japan Aerospace Exploration Agency (JAXA). The first of these was the Japanese Earth Resources Satellite (JERS-1) SAR, which was in operation between 1992 and 1998, and the Advanced Land Observing Satellite (ALOS) Phased Arrayed L-band SAR (PALSAR; 2006–2010). JAXA also implemented a systematic observation strategy that ensured complete continental coverage of these data at regular intervals and at times when data collection was most beneficial (e.g., for flood inundation mapping). The ALOS-2 PALSAR-2, their successor, was launched in 2014 and is providing a combination of spotlight, fine beam mode, and wide swath (ScanSAR) mode data. Airborne systems operating at X, C, L, and/or P-band include the AIRSAR, GEOSAR, UAVSAR, and EUSAR. Airborne Light Detection and Ranging (LiDAR) is being increasingly acquired over large landscapes, thereby allowing generation of digital elevation models (DEMs) of the terrain (DTMs) and surface (e.g., of canopies; DSMs). LiDAR operates in both discrete and full waveform mode, with the former recording several reflections for each transmitted pulse while the latter measures the entire return waveform at very high sampling frequencies. In both cases, significant information on the underlying surface, the canopy, and the vertical distribution of vegetation is obtained. A number of future missions are planned which will benefit the observation of wetlands. They among these are Sentinel 1 and Sentinel 2 constellations of the Copernicus initiative which will provide long-term access to enhanced radar observations and high-resolution super-spectral data, respectively, opening a new scenario for mapping, assessment, and monitoring of wetlands worldwide. The C-band imaging radar of the Sentinel 1 mission will provide all-weather day-and-night imagery which will be extremely useful for monitoring wetlands in cloudy conditions. The Sentinel 2 mission will provide systematic optical observations of all terrestrial and coastal zones, at 10 m spatial resolution, with a swath width of 290 km. Together with its twin satellite it will cover the Earth’s surface with a repeat cycle of 5 days at the equator. The impressive footprint of Sentinel 2 along with the short revisit time and its systematic acquisition policy will allow rapid changes in ecosystems to be precisely monitored and is ideally suited to monitor sensitive habitats such as wetlands. It will allow for seasonal and permanent changes in wetlands to be monitored with higher accuracy. The GMES sentinel data policy, with its full and open access for all users, is an important incentive that would largely facilitate the uptake of these new technologies by the wetland communities. While each of these sensors can be used alone, combinations of these data provide greater capacity for characterizing, mapping, and monitoring wetlands (e.g., Bwangoy et al. 2009; Michishita et al. 2012). The number and diversity of sensors is also increasing as more countries obtain capability for their launch and operation. A comprehensive overview of trends and the status of sensors is provided by Belward and Skøien (2014).